A few years back I was having lunch at my friend Iosif's house when he told me about a physics demo that he saw in high school back in the USSR (Uzbekistan) where they added salt or sugar (he couldn't remember) and the milk became transparent. Well, I finally did some more thinking about it and have tried to reproduce it. Searching the internet I was not able to find anything on this. So, I decided to try it for myself. After I had tried doing it myself, I found a solitary mention of this demo in the literature . Milk appears white or opaque because of the fat droplets in suspension. Fat has an index of refraction of about  while water has an index of refraction of . (The liquid surrounding the fat is mostly water, so I am going to think of it as just fat and water.) Because of this refractive index mismatch of the fat and water, light is scattered off of the microscopic fat droplets causing no light to make it through the milk. So, if you could match the index of refraction of the liquid the fat is in suspension with and the fat itself, you could eliminate the scattering. 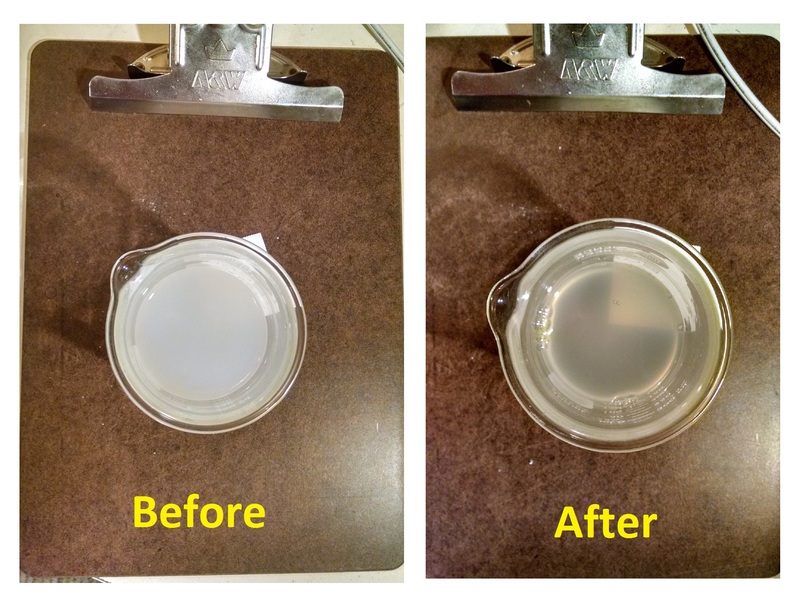 I'll add sugar to the water to get the index of refraction of the water, , to match that of the fat in suspension. In reference 3 (also see Figure 1 on the right), we find that the index of refraction of the fat droplets is . 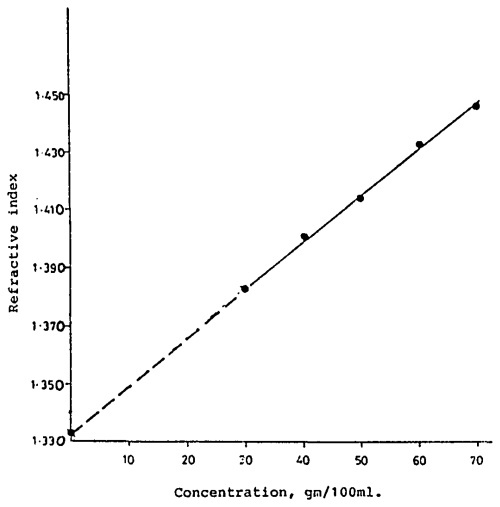 Similarly, from reference 4 (and can bee seen in Figure 2 bellow), it appears that the index of refraction of sugar water goes like where is the concentration of sugar in the water measured in . Putting these two studies together, we find that putting about 73 grams of sugar in 100 milliliters of water should match the two refractive indexes. This demo takes some time to do it right. The picture I have at the top of this page was my first attempt. One thing I would try next time is to saturate a mixture of sugar and water and add that to the milk water so you don't have to wait for the sugar to dissolve. I wouldn't have ever tried this if Iosif Shinder hadn't told me about it, so thanks. The whiteness of things and light scattering by L. M. Gratton et al. 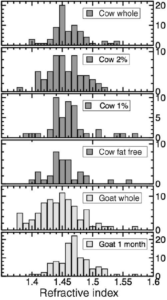 Optical parameters of milk fat globules for laser light scattering measurements by Michalski et al. 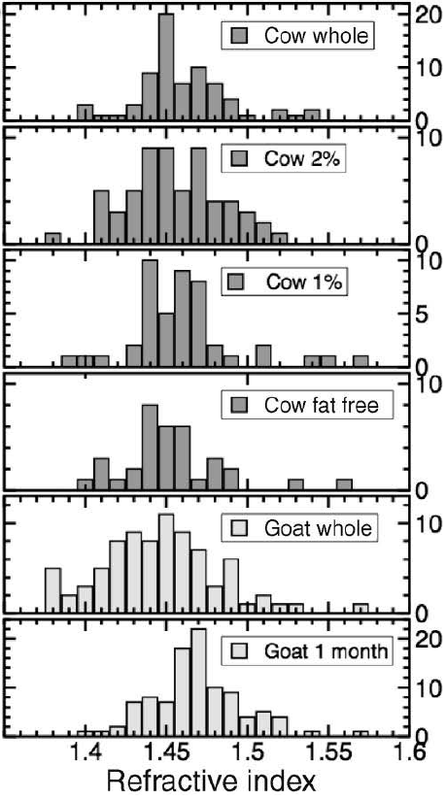 Technical note: characterizing individual milk fat globules with holographic video microscopy. by F. C. Cheong et al. 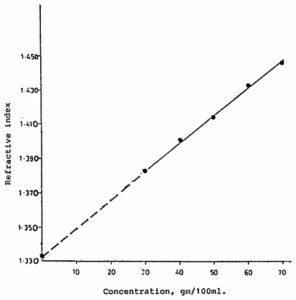 Refractive index of solutions at high concentrations by W. Mahmood et al.